Staircases allow you to navigate through different levels of your home and are a very important aspect of your property. 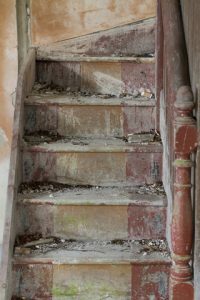 Solid staircases are secure and will bear weight and pressure easily but old and damaged staircases can be a big health hazard. Falls or slips can lead to broken bones and can even cause fatalities. At AC Joinery, we always ecommend repairing and replacing staircases ofor our clients as quickly as possible. Stairs, especially those made of wood, will degrade or develop problems over time. If you’re vigilant, you’ll spot and repair these problems early. Here are some warning signs you need to look out for. If you face any of these problems, you need to call us immediately. We can help you with all of these problems; if you need some feature fixed that’s not mentioned here, just give us a call and explain the issue. Our repair experts will arrive at your location to assess and repair the problem at the earliest. Our technicians will arrive at your location and assess your stairs carefully. The intention is to understand the root cause of the problem to ensure everything problem is repaired completely. Once they’re finished their assessment, they’ll offer a report and quote. They’ll take the time to explain the problem and solution to you and that would help you plan your budget and repairs. If the damage to your staircase is too extensive, we will recommend a complete replacement. We don’t make this recommendation lightly because replacements can be expensive. We can do single tread, partial, and full replacement, based on the extent of the damage. Our repair technicians will explain why they recommend replacements and offer a reasonable quote for the project to help you make the decision. If you want to know more about how we go about repairing and replacing staircases here at AC Joinery, don’t hesitate to get in touch with us. You can call us at 0161 980 7992 or contact us through our web form today.